Update: Kevin Aguilar and his team have confirmed his signing with the UFC. Add another fighter to the list of LFA champions who have received the call up to the UFC. It is being reported that Kevin Aguilar, the LFA Featherweight champion, will step in for an injured Arnold Allen to face Rick Glenn at the TUF 28 Finale. Currently on a 7-fight winning streak, Aguilar’s most recent win was a split decision victory on this past season’s Dana White’s Contender Series. 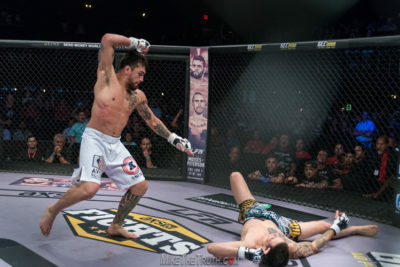 Prior to that fight, Aguilar had finished 4 of his 6 opponents, which included a first round knockout over Than Le at LFA 40 to unify the featherweight titles. The TUF 28 Finale is scheduled for November 30 in Las Vegas.